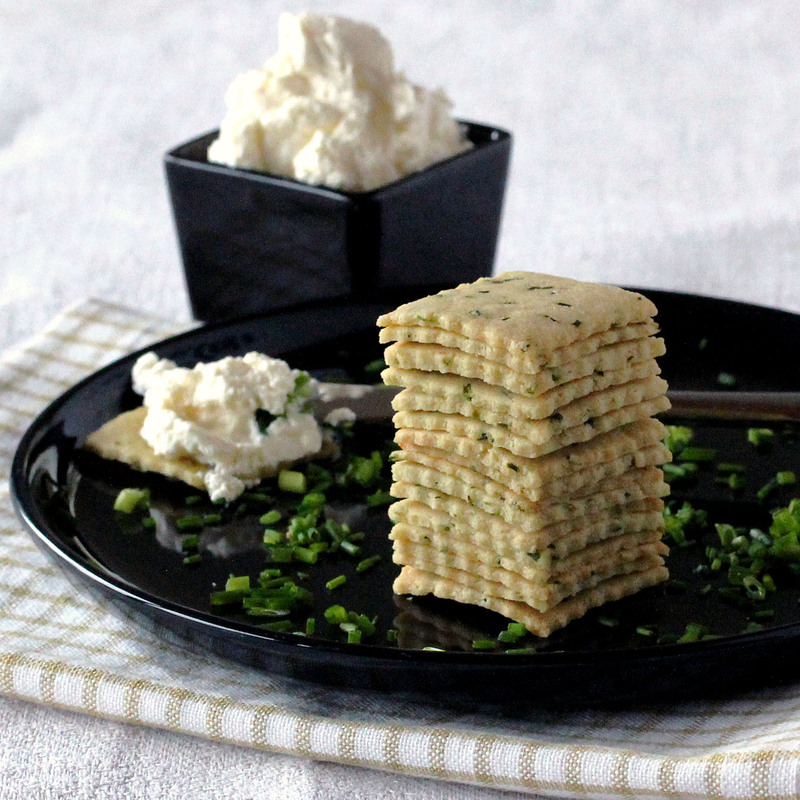 Sour Cream and Chive Crackers (Egg-Free) - Low-Carb, So Simple! -- gluten-free, sugar-free recipes with 5 ingredients or less | Low-Carb, So Simple! These are very simple and easy crackers to make. Chilling the dough and baking takes the longest time. For rolling the dough, I have developed a technique where I hold the rolling pin from the middle rather than from the ends. I press the rolling pin on the dough and roll it constantly pressing it firmly against the dough. From my experience this is the easiest and the fastest technique to roll this firm dough. In my first experiments I added one egg to the dough. The needed amount of almond flour was quite much in order to keep the dough firm enough. I used 2 1/2 cups (600 ml) almond flour, but the amount of dough was a bit too much so that it would have fit on one baking sheet. I wanted to reduce the amount of almond flour so that the dough would fit on one baking sheet. But, if I reduce almond flour, I have to reduce wet ingredients as well, otherwise the dough won’t be firm enough. Since you really cannot reduce anything from an egg (well, you could separate the egg and use either the yolk or the white), and reducing the amount of sour cream didn’t come into question because I wanted to have enough sour cream flavor, I decided to try what happens if I simply omit the egg. That was worth trying, the result was crunchy and the crackers melted in the mouth! With egg the crackers were crunchy, but the texture was a bit, um, leathery or so. It’s difficult to describe, but at least they weren’t melt-in-your-mouth crackers. I wanted to do some more experiments with the amount of sour cream. I used 2 cups (480 ml) almond flour and tried with 2.5 oz (70 g), 3 oz (85 g) and 4 oz (115 g) sour cream. The first brought the crunchiest results. The first batch I baked at 300 °F (150° C) for a half an hour. The edges got darkish and the center wasn’t crunchy. Then I tried to dry the crackers so that I heated the oven to 350 °F (200 ° C), put the baking sheet in the oven and turned off the heat. Quite okay, but it took some 5 hours before the crackers were ready and crunchy. In the end I found that 250 °F or slightly lower temperature (100 ° C) brings the best results. Chop the chives into small pieces. In a medium bowl, mix all the ingredients by hand. Knead for a half a minute or until smooth. Place the dough on a baking sheet lined with parchment paper. Place another parchment paper on the dough. Using a rolling pin, roll the dough between the two parchment papers as thin as you can. Cut the dough with a knife or pizza cutter into squares. Put in the oven and bake for 50–60 minutes. Check frequently so that the crackers don’t get too dark or burn. Cool completely and break into squares. These crackers are very easy to vary. Choose your favorites from the cornucopia of herbs and spices. Fresh or dried, mild or spicy, exotic or plain, everything suits. I made one batch of garlic bread crackers where I substituted 1 tablespoon garlic bread seasoning (used to be my all-time favorite seasoning and it’s discontinued now! Argh!) for chives. The crackers were really yummy! After baking so huge amount of crackers, I developed also some spreads and dips to go with them. Stay tuned for my spine-chilling, hair-raising Halloween spread recipe which I’m going to publish next week! I wonder if it would be possible to make this sweet instead of savory by adding a bit of erythritol and maybe a lower carb fruit puree? Would the moisture content be too much? It works perfectly for sweet things, too. Here’s a cookie recipe that uses the combo of almond flour and cream cheese plus powdered erythritol as sweetener: http://www.lowcarbsosimple.com/low-carb-linzer-hearts/ I wouldn’t add any fruit puree, it might make it too moist. OMG. I have been missing crackers and chips doing Keto. I LOVE these. My only issue is they were a bit salty but so easy to make. I did bake mine a bit longer and at the end bumped up the temp to brown and get them crispier. Thank you so much for this great and super simple recipe. I made these yesterday and they are by far the best keto cracker recipe I have found. They were also extremely easy to make. I have dried chives, but not fresh so can dried chives be used? Are the green parts of green onions the same as chives?? Dried chives are fine, but you need them less, let’s say 1 tablespoon. Green parts in green onions are different from chives. These crackers are delicious and very easy to make. However, how do you store them? I waited until they were completely cool and put them in a zip lock bag. The next day, they were chewy and lost all their crunch. I will still eat them but on Keto, I miss that crunch. Hi Helen, I store them at room temperature usually just in a bowl covered with towel or plastic wrap. For me they have always stayed crunchy. Thanks, Elviira. I will try that next time as these are really delicious. Hi there! I want to make these to take to a Christmas party, however I’m just wondering if they are firm enough for a Cheese and meat tray? Or would they be too crumbly for that? I love the recipe and use it often. Has anyone tried to sub out the sour cream with coconut cream? I would like to make this dairy free. Any ideas if the ratio might change? You are brilliant!!! I made these crackers tonight. They are SO easy and SO delicious!!! They remind me of cheeze-its! I’d swear that there’s cheese in these! Way to go! I’ll be making these on a regular basis and switching up the spices. Thank you so much, Holly, for your kind words! I make them on a regular basis, too, our whole family loves them! I have tried flackers in different variations and they all make me gag. I made these over the weekend and they are delicious!!! Need to work on the rolling because the center crackers were a bit too thick. Unfortunately, they are now mushy and disgusting, most likely due to the humidity here in Bangkok and my not-so-airtight container. :o( Moving back home to the U.S. next month so I think I’ll just wait until then to make them again. Thanks for the great recipe!!! Hi Lisa, so great to hear you liked this recipe! Rolling out the dough as thin as you can makes the best result. I used a half sheet backing sheet the roller was to wide so I went really old school using a large glass to flatten the dough. These crackers are delicious. Followed your directions to the T. The best recipe directions ever. On to the next batch. Fyi my husband said there is no way these are healthy lol. Hi Linda, thanks for your comment! Makes me happy you like the recipe (also the directions)! I took a tip from a commenter on another website, and used a tortilla press to get them really thin. They’re in the oven now, and they smell wonderful! My kitchen was really warm, and even though I weighed the ingredients, the dough dried out really fast and was a little crumbly, so I went my hands and re-kneaded it, then it was ok. I love this recipe. Lately I’ve been using one cup of almond flour and one cup of flaxseed meal and it has turned out really good! Great to hear you like them and thanks for the tip, have to try it out! Thank you for this awesome recipe! What is the best option for storing these? Refrigerate, freeze? Or is it ok to keep them in an airtight container at room temp? Hi Isabella, you’re welcome! Keeping them in an airtight container at room temperature is the best option to store them. Any suggestion on how much to use of the honeyville fine almond flour? I would suggest to start with half of the amount and add more if needed. Wonderful! Thank you for sharing your variations! I’m afraid hazelnut flour has a pretty strong flavor… Maybe macadamia flour or other more neutral tasting nut flour would suit better? Yep, you can make great Halloween stuff with sunflower seed flour / sunbutter and baking soda! Hi Ruth, I used a baking sheet that basically is the size of the oven, where the batch actually fits perfectly. The most important thing is to roll out the dough as thin as you can, so if you have smaller pan or baking sheet, you might have to divide the dough. Hope this helps! I know this is an old post for you but I just stumbled onto it a few weeks ago and these crackers are a staple in my low carb cabinet now. Sour cream and chive are one of my favorite flavors but I’ve also made Italian crackers with ricotta cheese replacing the sour cream and minced garlic and chopped basil replacing the onion. I also added 40g of flaked parmesan. Being from Texas I also have to have a spicy option so I made Mexican crackers with minced garlic replacing the onion, and adding 40g of cheddar cheese and 10g of chipotle powder. So good! Thank you, thank you! Hi Renee, thanks for your comment and sharing your variations! I’m so happy to hear you like them!! I also make these on a regular basis, mainly for my son for the kindergarten. He loves them, so do we all! Last time I put just onion powder for a little flavor and they were still great! Just put my second batch in the oven……THIS ARE WITHOUT A DOUBT THE BEST LOW CARB CRACKERS I have ever had!!!!!! I’ve tried quite a few but these beat all of them and so very very easy. THANK YOU!!!! THANK YOU!!! THANK YOU!!! I’ve also used spring onion, mixed dried herbs, Parmesan, sesame seeds, poppy seeds, salt & pepper . Will try lemon pepper too! Hi Katy, thanks for your comment and sharing your variations! So great to hear you like the recipe! Sorry I forgot to check the box that says it will notify me by email. So if you couldn’t respond to this one. Thanks!! Hello! I love that you have the protein and fat content listed. However could you tell me what the carb count is per batch of crackers. I think this would be a great recipe to try! Hi Hatti, ummm… there should be the carb count in total and per serving. Do you use mobile? Narrow displays can wipe out the rest of the table with nutrition info. This looks delicious! I have been looking for a good cracker recipe to put some brie on and this looks great! The almond flour that I have is a little grainy….do you recommend a fine almond flour or do you think what I have will work ok? I can put it in the blender to make a little more fine but thought I would ask first. Hi Sabrina, this is one of my most loved recipes, I hope you like it too 🙂 This recipe is made for coarse almond flour. If you use fine flour, you have to increase the amount of sour cream. I was wondering if it would work if you roll these into a log and wrap, refrigerate, and slice thin (like if you were making sugar cookies). I am horrible at rolling out dough, lol. Good question! Never really thought of that. I think the dough is stiff enough so that you don’t even have to refrigerate it to be able to slice it, though it might help anyway. That’s an idea worth trying! Great! I will eagerly wait for your comment how they turned out! This is the best cracker recipe I’ve made on the THM Plan. So simple and so delicious! I didn’t add the chives as I didn’t have any, and I did add cracked pepper instead. Just the basic recipe can have so many variations. Thank you!! I’d like to share your blog with my Facebook group because this is a must-have recipe and I’m sure there are more! I’d like to try these but I can’t have dairy, can you recommend any alternatives to the sour cream. I’ve been thinking of alternative for sour cream in this recipe but so far didn’t find a proper dairy-free solution. I have to continue experimenting and I will let you know immediately if I’ll find a proper substitute! What about unsweetened coconut milk yogurt? Or yogurt made from nut milks? Haven’t tried that out… If it has enough protein, it should work. Why is your web site so cluttered with ads and non-sense? Your recipes are fantastic but it’s like trying to navigate through a herd of zombies to attempt to get a recipe or page to load. Seriously rethink how much stuff is on your site – it makes it incredibly NOT user friendly. Yes, you’re absolutely right and I wish I could afford a better look. Ads are just one of the few ways to get some compensation of my work. Ingredients, hosting and stuff like that cost, and I just have to cover the costs somehow. You see, people want to have everything for free nowadays and are not willing to pay for anything, recipes, books or so. The result is this. I have no problem with the ads. In fact I dont even notice them. I simply scroll right past them. Thank you so much for all your tries on getting the perfect crunchy cracker! I cant wait to try these!! Hi Julie, thanks for your comment! I’ve dropped most of the ads, my site used to look quite crappy with plenty of ads, to be honest… I hope you like the crackers! No worries about the adds Elviira. I think people should be appreciating the time and effort that you are putting into a recipe. Look at all the trials that go hand and hand to reach the perfect end result. I thank you and will give this recipe a try. How do you fund your website, Tracy? Because if you don’t have one and simply choose to leech information from others for free, you really have no right to complain. I cannot tell you how many low carb crackers I have tried. This is the first one I have loved. I made mine with Mrs. Dash onion and herb seasoning,lemon pepper, onion powder, garlic powder, sea salt and dill seed. Yum. Yum. Thank you! Hi Barbara, thanks for trying out my recipe! Great to hear that you like it, makes me happy! Hi Lori, thanks for your comment and for trying out these! Your variation sounds delicious! Hi Maria, great to have you here 🙂 Ground flax should work perfectly (I often use it in crisp bread), but you need to add some fluid as flax absorbs so much fluid. Hi Myrna, thanks for trying out the recipe! Great that you liked these crackers. Hi I love these crackers, I was just wondering if anyone has frozen the dough? And if it was ok?? Hi Sarah, thanks for your comment! I haven’t tried out freezing either, so if anybody has, would be great to hear how it worked! I love this recipe ! So easy to make , takes 5 minutes from start to oven. How simple is that? I have made a few variations to this recipe. My kids fav is Parmesan cheese and chives. We have substituted the sour cream for homemade goats cheese which I use fine herbs in. We have added store bought goats cheese as well with jalapeno peppers. I make a coconut sour cream and a cashew sour cream for myself as I am dairy free and am looking forward to tasting them this week ! My grandson (3 yrs old) asked for Cranberries and blueberries to be tried next. Those will be next. The possibilities are endess! Hi Bev, thanks for your comment! Love to hear about your variations! Makes me happy that you like the recipe. Hi, I have not tried your recipe but it looks yummy. May I ask how many crackers this batch makes? Hi Christina! Thanks for your question, the yield completely depends on the size of the crackers. If I recall correctly, I usually get some 40 crackers that are approximately 1.5×1.5 inches (4×4 cm) in size. Hope this helps! Basically yes, if you find something with same consistency. Thanks Elvi! I will try it. Hi – Could you please advise which garlic bread seasoning you use and where you get it? (and how much you put in a batch of 2 Cup Almond Flour)? Thanks! Hi Keith, there is a link to the product I used where it says “garlic bread seasoning”. According to my writing, I used to use 1 tablespoon, but nowadays 2 teaspoon seems to do the trick. Hope this helps! I was wondering I’m not a big chive girl. Have you made or thought of any substitutes for the chive? Plenty! I hardly ever use chives anymore in these. I simply leave them out and use garlic bread seasoning, cajun seasoning, onion powder or whatever I happen to have at hand. Made these and they were very good. I rolled the dough very thin and I wished I could have gotten them a little crunchier. I brought them to work and got rave reviews. Stacie, great to hear that everybody liked them! I’ve noticed that the thinner you roll out these crackers, the crunchier they get. Maybe a bit longer time in the oven might help as well. Hi Debra, yes, I expect Greek yogurt works as well. You might have to slightly adjust the amount if the yogurt is very thick. I took a half cup of fritos, crushed them up coarsley and add them to my version. (no chives) (add 1/3 C Parmesan). it was an interesting variation. Hi Kev, yes, sounds like an interesting variation! Yes – well I don’t add salt (so that gave it some salt), and some extra crunch. Hi – I make these all the time. I don’t use any salt (I substitute onion powder and a little garlic powder). I also skip the chives. I do add a 1/3 cup of parmensan (Kraft). I like them a lot. They are never white like yours. Always dark. Any ideas why that is? Hi Kev, great to hear that you like the crackers! Parmesan sounds good addition, it gives flavor and has some salt as well, so additional salt is not needed. I wonder if it’s the Parmesan which makes the crackers dark. Have you tried without Parmesan? Were they still dark? Yes – I originally made them w/o parm and they were still dark (but I was using dried basil). Hmm, I wonder if they are a bit too long in the oven or if the temperature is a bit on the high side? Usually low temperature keeps them light-colored. I cook them at 250 f. They are really never light. By the way, I meant I used to use dry chives (not basil). I like the parm flavor better but would love to get a discussion going about variations to add. My diet is low carb (no sugar), so I would consider any good additions. Essentially though, mine is an almond flour based cracker with dry parmesan, sour cream and onion powder. Is there a possibility for you to still slightly reduce the oven temperature? 210 F or so? That might already make some difference to the color. Or, if you can take the crackers from the oven a few minutes earlier considering they are done? They still get a bit harder when they cool down. I still bake these crackers very often and actually I seldom use chives. Most often I use 1 teaspoon garlic bread seasoning (Frontier Natural Products, link in the end of the post) and 1 teaspoon Cajun seasoning (also from FNP) to create “tortilla chips”. They taste great and even better the thinner you roll out the dough. Sometimes I leave out the Cajun seasoning and just use garlic bread seasoning alone. I would also recommend different herb seasoning mixes and peppers, like freshly ground black pepper. I would expect Italian herb mix (oregano, thyme, basil, garlic, black pepper, etc.) go well with Parmesan. What do you think? I live fqar from any shops, on a farm so I battle to get all my ingredients together. Going to Cape Town shortly and will stock up then. Your crackers seem divine. Thank you. Hi Marilynn, hope you get all the stuff you need and that you like the crackers! I halved the batch the first time and weighed the sour cream and just threw in a bunch of chopped chives and it was fabulous! These are the best low carb crackers I have made! After 50 minutes I turned the oven off and let them sit in there for a bit. They are just cruncy enough. Can’t wait to make another batch! Hi Lisa! Thank you for your comment and trying out my recipe. Makes me really happy that you like the crackers! Do I weigh the flour or use a measuring cup as I would usually do to measure out 2 cups of flour? I think the best way is to weigh the almond flour, as it’s a more accurate method. Can you use a dairy free sour cream? These look so good, but I have a dairy allergy too. Thanks! Hi Donya, as long as it has similar, smooth texture like the dairy version, it should work. The sour cream binds the ingredients together, and for that it has to be smooth and silky. Otherwise the dough won’t hold together. Hope this helps! Will tofu sour cream work? Hi Janet, I haven’t tried sour cream tofu with these, but if it has similar, smooth texture like the dairy version, it should work. The sour cream is for binding and because of that the texture needs to be smooth so that it holds together. Can I use ricotta cheese instead of the sour cream? Hi Ivana, I think ricotta might be a bit too stiff stuff, but of course you can try. Maybe you can add a splash of milk, cream or water to make the batter easier to knead. Just be sure not to add too much fluid, the batter has to be really stiff that you can roll it and cut out shapes from it. Hope this helps! No way! If you take two cups of almond flour and add 2.5 ounces of sour cream, how could that bind together? Add a quart of water? (sarcasm) I tried and it would not come together until I added about five times the amount of sour cream. The result was not pretty! Hi, I’m sorry to hear that you were not satisfied. What kind of almond flour did you use? Was it either extremely finely ground almond flour and/or fat-reduced almond flour? Did your two cups of almond flour weigh 8 oz? I use brands like Bob’s Red Mill, which is not fat-reduced or not very finely ground. Usually it looks at first that the ingredients won’t bind together, but if you continue kneading, the dough will be just fine. Obviously this didn’t work for you. I wonder what went wrong. I’m new to wanting to try using almond flour. I’m surprised that 2C. is 8 oz. I thought 1 cup is 8 oz. I’m guessing that almond flour is very light and flour compared to regular flour…as I said, I’m new to using almond flour. Thanks for any help. Also, is their a difference with almond flour and almond meal? Hi Lexy, thanks for your comment. In general 1 cup almond flour (like Bob’s Red Mill) weighs 4 oz. Almond meal is indeed more coarse than almond flour, and the texture of almond flour differs between manufacturers. For example, Honeyville almond flour is very fine and you might need to adjust the amount (usually you need to use a smaller amount of fine-textured almond flour than more coarse almond flour). This recipe is made with Bob’s Red Mill almond flour (link in the recipe ingredients), which is on the coarse side. Any similar type of almond flour/meal will be okay. Hi Allison, I wish I could help, but it’s so long time since I’ve baked with regular flour that I have to admit that I have forgotten most of it. However, I doubt the substitution works just like that, I expect that you have to adjust the amount of sour cream as well. I wonder if an egg is also needed for binding. I’ve cut eggs out lol. Thankfully wheat is still my friend. Perhaps I’ll give it a try, what texture should the dough be—pliable but not sticky ? Ok, then no eggs 🙂 Yes, exactly, the dough should be pliable but not sticky. I think it’s a good idea to add the flour gradually and knead well after each addition, until you have reached the desired consistency. I always roll out the dough between two parchment papers, but if you use wheat flour, I guess you can leave out the topmost parchment paper and just sprinkle wheat flour on top of the dough that it doesn’t get stuck to the rolling pin. Almond flour based dough just usually requires two parchment papers, because it simply gets stuck to the rolling pin. I’ve read a lot of recipes that say you can substitute sunflower seed flour for nut flours and it works just as well. A good option for those who are allergic. Thanks, Carol, that’s a very valuable tip! I made these crackers and they turned out great! I love your website! I was wondering how you store them once they’ve been made…in the pantry or refrigerator? Hi Amber, thank you for your kind comment! Wonderful that you like the crackers. I would recommend to store them covered at room temperature, in the fridge they get soft and moist. Btw, you have a very nice blog! Hi Alana! Welcome to my blog 🙂 Hope you like these crackers, for me they have always been a huge success, last time I served them in my Halloween party (I cut out bat shapes from the dough). If you try them out, please tell me how you liked them! Hi Diana! You’re welcome 🙂 Great to hear that you like my cracker recipe! These look amazing! I plan to make them for my next batch of crackers. Love sour cream and onion chips, so I’m sure I’ll love these! Thanks for stopping by and let me know how you like them if you try them out! Danielle, I’ve had good experiences in freezing the ready crackers. I just put them in a ziplock bag. They keep well in the freezer for a couple of weeks. These look tasty! I have no chives on hand, but may make some of these today with cayenne pepper and a touch of garlic in the dough, then on the last roll of the rolling pin, sprinkle some sea salt on top and lightly press it in before baking. I’m a bit of a salt fiend. Bet they’d also be great with rosemary and a bit of lemon zest in them, and with cracked black pepper lightly pressed onto them before baking. I’m looking forward to making a variety of yummy crunchies, and am thinking these will be a handy treat for me to take when we go to family get-togethers for the holidays! Thanks! Hi Lene! Thanks for the comment! The beauty of these crackers is that they are easily modifiable, you simply can use your favorite spices. And your ideas for variation sound wonderful! Especially the combination of lemon zest and black pepper is really yummy! These crackers sound fantastic. I am not sure which type of sour cream you are using. Is it the pudding-like texture sour cream that is bought in containers, or the liquid pourable type? Nancy, thanks for your comment! I use sour cream which has pudding-like texture. Hello, the nutrition content is cut off how many servings does this make and how many crackers and carbs per serving? I have made this recipe with both sour cream and plain Greek yogurt and both are amazing. I crave these crackers. They are the best snack and they are best plain. I have tried to “improve them” with a piece of cheese or some spinach dip. But they are best by themselves. Thanks, Brandy, for your comment! Great to hear about your variations and that you like the recipe. What’s your favorite way to serve these crackers. I know everything would be great but what is your personal, most often used item to put on top? PS….Celery has never looked so beautiful as it is in a beautiful picture of you. Hi Lexy, thanks for the compliments 🙂 I prefer to serve these with cream cheese spread (usually some herbs and salt mixed with unflavored full-fat cream cheese), or then just with pure cream cheese.